For 2018, we are offering a variety of services and products like previous seasons. Like last season, offerings are limited availability as Mel has started grad school and will be participating in a few research projects. This year, Mark will be handling package bee orders. We will once again be collaborating with Wingsofnaturebees.com based in the coastal Santa Cruz mountains of the Bay Peninsula Preserve south of San Fran to rear early season ZQBxNorCal Survivor stock. Limited availability. Melanie will be producing cells with wingsofnaturebees (available early spring in CA only). And a few batches of Enchanted Empress Breeding Companions for established queen producers and breeders, research endeavors and community oriented service and outreach programs will be available in June, July and August. No regular batches of production queens will be available this year. Pollination– Contact Mark at 505.929.8080 or email longevibees@hotmail.com for pricing and availability. 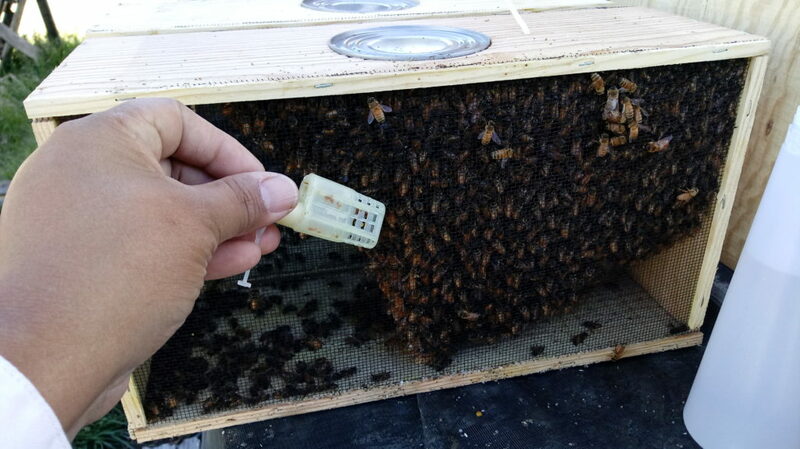 Package Bees (limited availability- reserved for established beekeepers)- We are collaborating with a couple of queen producers and developing bee breeders in other parts of the country to produce package bees with ZQB cross-stock lineage. We are only offering 3 pounders which will have a ZQB survivor stock mated queen. We transport our own breeders to NorCal to rear queens for these and we also strictly adhere to a 3 week minimum rearing calendar. Cost is $200 for 3# package. Contact Mark at 505.929.8080 (or email him at longevibees@gmail.com). Queen Cells (available late March in CA) & Virgin Queens (monthly batches May-August)– contact Melanie at 505.901.2102 (text for faster response) or Email ziaqueenbees@hotmail.com. Advance reservation required (2 weeks minimum). All virgin queens grafted from selected ZQB Longevity-based Breeder Pool. Each virgin queen will need to be placed in their own mating nucleus hive (split) and allowed to mate out with area drones to establish laying posture (approx. 3 weeks). This is a good way to integrate quality cross stocks. Cost: $20/virgin (shipped in JzBz cages within 3 days of emergence to ensure exoskeleton hardiness and with attendants in each cage for prolonged viability; must be installed promptly and left uninterrupted for minimum 2 weeks). Added shipping cost through USPS Express shipping for locations east of the Mississippi; Priority flat rate available for locations west of the Mississippi. Enchanted Empress Breeder Companions (available June-August)- contact Melanie at 505.901.2102 (text for faster response) or Email. All Breeder Companions are mated out in isolated mating apiaries in the southern Rocky Mountains. Diverse survivor drone stock saturates each mating zone giving cross stocks with diverse genetics capable of integrating into existing or developing breeding programs and rearing operations. Cost is $200/each (Includes marking. Conservative clipping available upon request). Express USPS Shipping with insurance add $35.00 (up to 10 queens in same container shipped in JzBz cages with attendants). Consultation– Melanie and Mark are each available for consulting opportunities. Each is skilled in advanced beekeeping and queen breeding facilitation and manifestation. Whether looking for one person or a team to help with developing or advancing existing programs- each is capable of assisting and coaching all levels of stewards and diverse apicultural projects. Consultation fee depends on location and duties required. All travel, lodging and per diem expenses are to be assumed by inquiring parties along with consultant honorarium. For requests, please submit in writing nature of requested assistance, location, and duration by email to ziaqueenbees@hotmail.com. Follow up telephone/conferencing interviews will be scheduled prior to decision. Honey, Propolis, Royal Jelly, Beeswax Arts, etc. – We will be offering honey and other bee medicines as usual. Honey: Limited quantity available from 2016 season. Pure and Raw, Unfiltered NM varietals from spring (Rio Grande Bosque Bliss), summer (Santa Fe & Taos), and fall blooms (Ojo Caliente and Christ in the Desert Monastery). 2017 honeys will not be harvested until June at the earliest for spring bloom; August for summer blooms; and October for fall blooms. Retail is $1/ounce. Limited wholesale accounts offered for like-minded enterprises. Propolis: Mark makes a mean tincture- destined to help with any ailment, from skin conditions to internal infections. Tincture is $10/bottle (infused in grain alcohol). Capsules also available for $3/capsule. Our pure NM propolis is also available by the pound for $150 in usuable, small flakes that are easy to dissolve. Also available is propolis balm at $15/jar (made with organic coconut oil and NM propolis). Beeswax: All of our beeswax comes from fresh honeycomb cappings and is thus- light to golden yellow. Beeswax rendering is a very time consuming effort and is available with advance notice (minimum 1 week). We offer beeswax for $25/lb. Limited quantity. Also available are hand dipped beeswax candle tapers, mold candles and beeswax arts including mobiles, pendants and jewelry. Balms & Salves: We also offer wildcrafted pure NM beeswax based lip balms and healing salves. Lip Balms are available in mini tub or recycled plastic tube containers for $5/each. Healing salves come in 3 kinds: Plain/Natural beeswax with organic olive oil; Rejuvenation with essential oils of lemongrass and lavendar and organic olive oil; and Boo Boo or Todo-Tipo with essential oils of eucalyptus, spearmint, lavendar and organic coconut and olive oils. Healing salves are $10/each. As always, we value all of our clients and wish everyone a healthy and prosperous bee season. We look forward to the coming years of ZQB and our individual and collective endeavors as we continue to share the best of what we have with as many as we can.